In weeks like these, where I feel constantly behind, it's hard to find down time at night. As a result, I occasionally take the extra 20 minutes at home in the morning to make a proper breakfast. I understand this flexibility to be a luxury; these days, most of my friends are packing diaper bags and hustling a herd of children out the door every morning. But for me, those 20 minutes make me feel civilized and satisfied. In spring, it's yogurt, granola, and some frozen blueberries (which I rinse with warm water to thaw). But it's still March, and much as I'd like to deny it, it's still pretty cold out. For frosty mornings like this one, I humbly recommend this porridge. I'll cut right to the chase: this porridge, it is salty. I mean, it's seriously got a punch of salt. But, as April says, after that first hit of "whoa, savory! ", the porridge fades into milky sweetness. Oatmeal is a humble food, but this porridge feels somehow luxurious. Which, incidentally, makes it the perfect porridge for an ever-slightly-slower weekday morning. For those of you without time to spare on workdays: not every nice weekend breakfast must include biscuits or pancakes (though if you're making those, I recommend these and these. And these. Okay okay, one more.) When I visited Jess and Eli last year, Jess gave me options for brunch, and one of those was oatmeal. I loved that she'd make oatmeal for company. What a revelation! 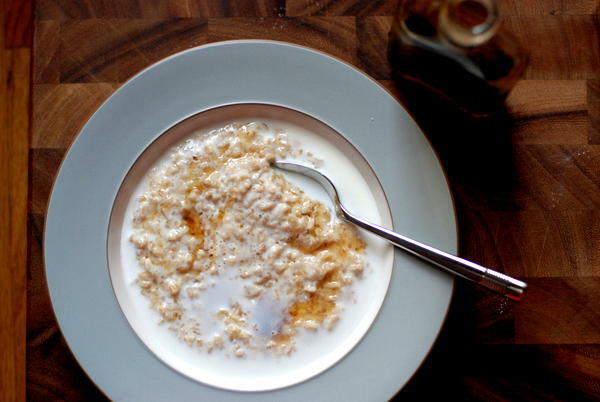 Of course, oatmeal is the perfect company-for-brunch food. Make a big pot and let guests dress it up as they wish. So I guess I'm saying, this weekend, let this oatmeal be your porridge-for-company recipe. It won't disappoint. If anything, your guests will think you brilliant. Yea, brilliant. April Bloomfield's PorridgeAdapted from A Girl and Her Pig, April Bloomfield's new book, which just won the Food52 Piglet award and almost as quickly found its way into my library; it's a fantastic book. You will learn a ton from reading and cooking Bloomfield's recipes. See here for a lovely review by Stanley Tucci. As I said above, this porridge is Salty, with a capital s. That's why I love it. If you're nervous about the salt and want to start slow, reduce the quantity to 1 teaspoon. Also, if you don't have salt that is truly flaky, as Maldon is, reduce the quantity even further. You should probably use only about 3/4 teaspoon of fine sea salt. bring milk, water, and salt to a simmer in a medium pot over high heat. When liquid starts to simmer, add both oats, stir to combine, and reduce heat to medium. Cook the oats at a steady simmer, adjusting the heat as necessary and stirring occasionally to prevent the mixture from boiling over. At 20 minutes, the steel-cut oats will be just cooked and the rolled oats will have melted into the porridge. Taste the porridge. Salty! You're now going to adjust the flavor by adding maple syrup or brown sugar to taste. I used the full 2 tablespoons, and maybe even a wink more to serve, but start with 1 and see where you are. You want the porridge to start salty and then fade into sweetness. What I'm about to say will sound a bit blasphemous, but the balance of salty and sweet is a much more refined, successful version of what those instant oatmeal packets are trying to accomplish. Here, it works. Once you've achieved the balance of salty and sweet, spoon the porridge into bowls and top with a splash of cold milk and maybe a pinch more of brown sugar or a dribble of maple syrup. Serve immediately.